It doesn't seem sensible to launch a new MOBA in 2016, especially with games like Magicka: Wizard Wars shutting down prematurely, and the firm stranglehold League of Legends, Dota 2 and Heroes of the Storm have on the genre. Still, Auto Age: Standoff has a very interesting hook: it's a MOBA with vehicular combat. 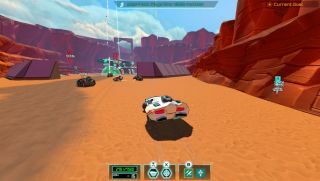 "Auto Age: Standoff is a colorful car combat MOBA presented in the style of 1980s action cartoon," the Steam description reads. "Players square off against each other (or work together) to crush enemy defenses and vehicles while protecting their own." Importantly, this can be done while catching unrealistic air and doing doughnuts. In addition to a MOBA-oriented Battle mode and a PvP Duel mode, Auto Age will also have a single-player campaign. You'll be able to customise your "combat vehicle" with all manner of bodies and decals, as well as unlockable equipment. It'll be available this autumn, or spring in Australia.